Senior horses (those in their midteens and older) can continue to live healthy, productive lives if given the special care they need. We asked Barb Crabbe, DVM, Horse & Rider magazine’s consulting veterinarian and author of The Comprehensive Guide to Equine Veterinary Medicine (Sterling Publishing Co., Inc.) for her advice. She stressed that older equines need all the same basic care other horses do, including regular vaccinations and deworming, plus routine hoof care. Beyond that, here’s what she recommends you do to keep your senior horse going strong. As with humans, exercise benefits an aging horse in multiple ways, including keeping muscles strong and joints operative (which preserves his ability to rise from the ground after resting). Full-time turnout (with appropriate pasture mates that won’t haze or injure him) is ideal. With under-saddle exercise, keep expectations realistic. A 25-year-old horse is roughly comparable to a 75- to 100-year-old human. And while there are some 80-year-old humans running marathons, many others are already in wheelchairs. So stay aware of your own senior horse’s changing capabilities and energy levels as you continue to ride him. Tooth problems, common in older horses, can contribute to malnutrition, weight loss, and colic. Periodontal disease is also a hazard as horses age. Schedule once- or twice-a-year checks by an equine dentist or veterinarian, and watch for trouble signs: difficulty chewing, dropping food, a bad smell from the mouth. The simplest way to achieve good nutrition for your older horse is by providing a commercial feed specially formulated for senior horses. Feed such pellets in addition to forage (grass or hay); or, if the horse has severe dental problems, use the product as a complete feed, moistening with water as necessary. Your vet can watch for conditions and diseases common to older horses, including digestive difficulties, Cushing’s disease, insulin resistance, melanomas, and kidney or liver problems. Schedule vet visits once or, even better, twice a year. Older horses have decreased reserves and increased susceptibility to serious infections and colic caused by dehydration or impaction. They’re also more attractive to biting insects, and may be more sensitive to temperature extremes (though you needn’t necessarily blanket your senior horse except in the most extreme cold— see below). 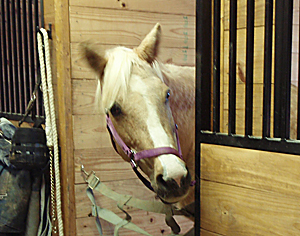 Watch for signs of illness, and act promptly; provide adequate pest protection; and make sure your oldster has accessible shelter (where other horses won’t drive him away). A daily grooming promotes circulation, helps head off skin problems, and enables you to catch the start of small troubles before they become problematic. Especially during the winter, run your hand over your senior horse’s barrel regularly to check for ribbiness that might not show under a long haircoat. If severe weather dictates that you blanket your older horse, be sure to remove and replace the blanket once a day to check for trouble. In my practice in the Northwest, I see more problems from older horses wearing blankets that never get removed— resulting in injuries and bad blanket rubs or sometimes severe undetected weight loss. Many older horses living in pastures with good shelters and plenty of fiber (the digestion of which helps generate warmth) don’t need blanketing. If you’re in doubt, ask your vet. This entry was posted on Thursday, October 18th, 2012 at 5:28 pm	and is filed under Horse, News & Updates. You can follow any responses to this entry through the RSS 2.0 feed. Both comments and pings are currently closed.